Uiseong county is very famous for garlic in South Korea. So our women’s curling team is called as garlic girls because four of them (the team) are from Uiseong. They’re friends and sisters each other whom were born and grew up in the same town, Uiseong. This is our first time that our curling team went to the final (and even semi-final) so our nation is very exciting to watch their match and especially their hometown is now enjoying this winter olympic because of those amazing Garlic Girls. Many of international reporters reported about them (e.g. NYT) and their hometown through different types of media during last few days. And they were very interested in the people of Uiseong and how they’re cheering for their hometown girls. Most of them are ajummas and they brought their homemade signs, screamed and even danced together! This is amazing!!! When I read their articles and watched videos on YouTube, I was so glad to know that those international reporters filmed about our energetic and sweet ajummas. They are not mothers of garlic girls but they are those girls’ neighbours so they prepared homemade signs and danced together to cheer for their ‘hometown daughters’. Because they feel like those garlic girls are their daughter (even though they’re not their biological mother but they’re mother!). These ajummas are cheering for their daughters because they want to share their ‘Jeong’ with those girls, I think. This video of people in Uiseong makes me laugh and cry. Beautiful ajummas with warmheartedness. Grandma’s diary!!! (Finally we have grandma (ajumma)Youtuber!! Oh My God!!! I’m so exciting to see this ‘Grandma’s Diary’ Youtube channel. I really like and find a variety of Korean Youtubers and watching their videos whenever I have spare time. And it was rare to find an ajumma Youtuber…BUT I found an amazing Youtuber today and the title of her channel is ‘Grandma’s Diary (박막례 할머니, Grandma Mak-Rye Park)’. The title is Grandma’s diary but I think she could be considered as an ajumma, too. There is no subtitle for non-Korean speakers yet but you can understand what she’s saying through watching her videos. In the video that I share below shows that grandma Park explains how she does makeup for meeting a dentist. She is so lovely! I keep watching her videos! A trot song is for ajummas? I’ve already posted this video of Digital Ppal-let-ter project that is a part of my research project. For this video, I used two trot songs as a background music. When I chose these trot songs as bg music, I thought that using this kind of songs for my video should enhance people to get inspired for better understanding about Korean culture. Well, we have K-Pop (idols, girl groups, etc.) but for me, these songs are inadequate to support my video project that is about Ajummas who are women in Korea. I consider choosing songs and I finally found one song that is about ajummas. The song called, Ajumma by Jinah Tae has very simple lyrics but it encourages ajummas to keep enjoying their lives as ajummas in Korea. Also, there’re not enough (maybe this song is the only song about Ajummas with positive lyrics as far as I know) songs about ajummas. I’ve changed songs for the video several times and I discussed carefully about choosing music with my supervisors all the time. Finally, I put that song for my video and I believed and still believe that the song supports the story (or research) of the video. Moreover, it enhances people (audiences) to somewhat better understand Korean ajummas’ culture. But, some people criticised the usage of this song for the video about ajummas. They thought this song (trot songs) is cheesy and it could remind audiences about stereotypes of ajummas. In other words, the trot songs are cheesy and not classy songs. So the purpose of choosing the cheesy trot song for the video is because ‘I (a researcher)’ look down upon Ajummas. Okay, I accept those feedback or criticism from others. But, let me talk about this again. The problem is not about a song in this video, I think. The problem is ourselves. I know how women in Korea were persecuted under patriarchal society for ages so Korean women had to receive unfair treatment only because we were women. One of Korean female group, ajummas, they were also treated, showed, described and accepted negatively. 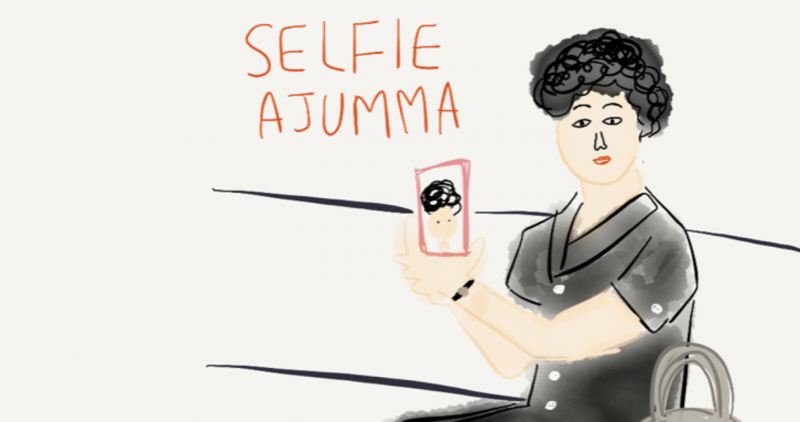 For many reasons, being ajummas and calling as ajummas is not pleasant. But, in my experiences, we (women) disdain ajummas, being ajummas and living as ajummas so many times and cases. In the case of using that trot song for the video, I never assume that trot songs are for ajummas and ajummas have no interest of listening pop songs, hiphop or electronic music. My mum loves listening to classical music and one of my friend enjoys listening to trot musics. I don’t generalise any thing between different generations. Of course, there are preferences of something between different generations, but I always think I shouldn’t generalise people only because their age differences. If they (people who criticised me of using trot songs for this video) think the usage of trot songs for this video is because I have a prejudice against ajummas, then I want to say them to break your biased perspective about ajummas first. It will take time to change but I want to keep writing that calling as ajummas and being ajummas are not that unpleasant thing what some people detest to be ajummas. ‘카톡하자!’ 카톡은 이미 대한민국에서 가장 많이 사용되어 지고 있는 모바일 커뮤니케이션 어플리케이션 중의 하나가 되었다. 이미 말했다시피, 카톡을 통해서 우리는 대화 그 이상의 것들도 공유하고 (사진파일, 비디오 파일) 또한 문자 소통 뿐만이 아니라 다양한 방식의 소통을 실시간으로 할 수 있게 되었다. 이러한 카톡의 사용은 특히 ‘아줌마’들 사이에서도 엄청난 인기이다. 내가 아줌마와 스마트폰에 관한 연구를 시작하게 되었던 계기도 바로 우리엄마와 엄마 친구분들이 서로 카톡을 통해 소통하는 행태가 매우 흥미로웠기 때문이다. 뭐 사실 카톡을 사용하는게 별로 특별할 것도 없는 일이 되어버렸지만 (친구 만나서 이야기 하는 것 또는 이메일로 소통하는 것과 크게 다르지 않지만) 소위 말하는 디지털 소외계층 이었던 중년여성인 아줌마들의 카톡을 통해 소통하는 모습은 뭔가 달랐다. 아줌마들은 매우 바쁘다. 특히 50대 중반 이후의 아줌마들은 더 바쁘다. 일을 하시는 분들도 계시겠지만, 우선 그 나이때의 아줌마들이 바쁜 이유는 이렇다. 그 나이대의 아줌마들의 자식들은 이미 대학생이거나 직장인 혹은 때로는 결혼한 자식들도 있고, 남편들도 이미 회사나 일터에서 높은 자리에 있겠고 따라서 이러한 50대 중반 이후의 아줌마들은 자기만의 시간을 갖을 수 있게 된다. 자식의 교육이나 남편의 내조 (여성이 반드시 내조를 해야한다고 말하는게 아니다, 우리 엄마 세대의 분들은 대부분 가정주부로 우리 가족을 위해 엄청난 일을 많이 하셨다. 여성비하라고 생각하지 말길. 그리고 집에서 가족을 위해 일을 해주시는 우리 엄마들 그리고 지금도 육아에 힘을 쏟고 있을 우리의 젊은 엄마들이 얼마나 대단한 존재인지 아는가? ), 아무튼 이러한 가족을 위해 일을 하던 엄마들도 나름 ‘은퇴’를 하게 된 것이다. 아줌마들은 친구를 만나고 자신들의 관심사인 커뮤니티에 들어가서 활동을 하고 배우고 그렇게 아줌마들은 엄청 바빠지게 되는 것이다. 예를 들어, 매달 모이는 모임의 수만 해도 엄청나다. 동창모임, 아이들 학교에서 만난 엄마들 모임, 종교모임, 찜질방 모임, 계모임, 동네 아줌마들 모임, 문화센터 모임, 기타등등. 수많은 모임에 참여하며 우리의 아줌마들은 그들만의 시간을 누리고 있는 것이다. 이렇게 바쁜 아줌마들에게 카톡의 등장은 너무 반가웠던 것이다. 설문조사와 딥포커스 인터뷰를 통해 알아본 바, 카톡의 사용은 이러한 아줌마들의 다양한 모임과 커뮤니티 활동에 도움을 주고 있다고 응답자들이 대답했다. 카톡을 사용하기 전인 프리 카톡 (pre-ka talk)시대에는 총무 아줌마 같은 분들이 모임에 관한 시간과 날짜를 모임에 나올 다른 아줌마들에게 일일이 전화를 걸어 답을 구해 그 답을 모아서 적당한 시간과 날짜를 정했어야 하는 엄청난 번거로움이 있었는데, 카톡은 그러한 불편함을 한 방에 해결해 주었다. 단체 카톡방에 모여서 모임에 대한 날짜와 시간을 정할 수 있게 되었고, 매우 간단하고 효율적으로 모임을 관리할 수 있게 해주었다. 또한 한 가지 더! 카톡은 단순히 모임에 관한 이야기를 하는 곳이 아니라 아줌마들의 또 다른 모임 공간이 되기도 한다. 실질적인 만남 (Face-to-Face)을 통해 소통을 하기도 하지만, 카톡의 단체톡방, 즉 모바일 공간 (Mobile Space)혹은 제 3의 공간 (Third space)에서의 만남을 통해 끊임없이 소통을 이어갈 수 있게 된 것이다. 눈으로 볼 수 없는 가상의 공간인 카톡 단체방이지만, 그러한 제 3의 공간에서 아줌마들은 시간과 공간의 제약없이 계속 관계를 이어갈 수 있게 된 것이다. 즉, 매 달 모이는 정기적인 모임을 갖고, 그 모임이 끝나면 다음 모임에 관한 이야기를 카톡 단체방이라는 공간을 통해 이야기한다. 여기서 카톡 단체방은 바로 실질적인 오프라인 모임에 관한 이야기를 하고, 그 다음에 이어질 또 다른 오프라인 모임에 대해서 이어주는 다리 역할을 하고 있는 것이다. 아줌마들이 점점 스마트해지고 있다. 일상생활 속에서 스마트폰을 사용함으로써 아줌마들은 똑똑한 소통을 하게 된 것이다. 아줌마들의 스마트폰 사용이 증가하게 된 이유는 물론 기술의 발달이 한 몫을 했고 거기에 더불어 스마트폰을 이용한 모바일 커뮤니케이션에 아줌마들이 동참하였기 때문이다. 사실 뉴테크놀로지와 뉴미디어에 관련된 연구는 대부분 ‘젊은층’을 타겟으로 , 아니면 ‘노년층’에 초점을 두었었다. 하지만 이제 우리는 ‘아줌마’에 주목해야 한다. 왜냐하면, 아줌마들의 움직임이 심상치 않기 때문이다. 스마트 아줌마들이 몰려오고 있다! 위의 표를 보면 알 수 있듯이 한국의 스마트폰 보급율은 세계 평균의 값보다 월등히 높다. 그리고 2015년 Digieco의 통계자료에 따르면, 대한민국은 스마트폰 보급율이 83%로 스마트폰 보급률이 세계 4위인 것으로 조사되었다 (Yonhap News 2015). 즉 한국은 스마트폰 천국인 것이다. 다시 말하면 ‘당신은 한국에서 스마트폰으로 뭐든지 할 수 있다!’ 는 뜻이다. 하지만 테크놀로지는 결코 우리에게 편리함만 가져다 주지 않는다. 편리함이라는 장점을 줌과 동시에 불편함이라는 단점도 함께 주는, 인터넷과 같이 양날의 검이 바로 테크놀로지라고 생각한다. 물론 스마트폰으로 뭐든지 할 수 있겠지만 이는 달리 말하면, 스마트폰이 없으면 아무것도 할 수 없음을 말해주는 것이다. 예를 들어, 얼마 전에 집에 가스검침을 해주시는 분이 왔었는데, 앞으로는 도시가스 앱을 다운받아서 거주자가 직접 스마트폰을 통해 정보를 입력하는 시스템으로 바뀔 것이라는 이야기를 하셨다. 검침원 분들이 가가호호 방문해야하는 번거로움이 사라지는 ‘장점’이 생기겠지만 동시에 스마트폰에 익숙하지 못한 분들 혹은 아직 스마트폰이 없는 분들은 이러한 새로운 시스템을 이용하기 위해 스마트폰을 새로 구입해야한다거나 아니면 앱 사용법을 익혀야 하는 번거로움이 새롭게 생겨나는 것이다. 사실 요 몇년 동안 가끔 한국에 들어올때마다 놀라는 점은, 대부분의 시스템이 매우 ‘스마트 (스마트폰을 이용해야하는)’하다는 것이었다. ‘스마트폰’을 이용해야하는 시스템을 거의 대부분의 경우에서 사용하고 있어서 스마트폰이 없거나 앱의 사용이 불편한 사람들에게는 ‘노스마트 (non smart)’한 경험을 해야만 하는 것이다. 마트에가서 디스카운트를 받을때도 앱을 설치해야하고, 내가 좋아하던 커피빈의 핑크카드도 무조건 앱으로만 써야했고, 보험사에 필요한 서류를 보낼때도 카톡 친구를 맺은 뒤에 사진을 찍어 블라블라 보내라는 등의 ‘스마트폰 없이는 안되는’ 일상생활이 되어 있었다. 아무튼, 스마트폰은 이미 우리의 일상생활에 스며들어 좀 더 편리하고 간편한 모바일 소통을 할 수 있게 해준 디지털 기기이다. 또한 단순한 ‘소통’ (전화통화등의 보이스 커뮤니케이션) 뿐만이 아닌 다양한 활동을 통해 나의 지인들이나 가족 친구들과 ‘언제 어디서나’ 소통을 할 수 있게 도와주는 매우 고마운 커뮤니케이션 기기이다. 하지만 과연 아줌마들도 스마트폰 사용을 많이 하고 있을까? 그렇다면, 과연 정말 아줌마들의 스마트폰 사용은 증가했을까? 그걸 어떻게 증명하지? 그래서 찾아본 결과, 아줌마들의 스마트폰 사용에 관한 데이터는 아직 없었고, (2015년 당시) 대신에 인터넷 사용에 관한 자료는 찾아볼 수 있었다. 사실 이렇게 ‘자료’들이 나오면 너무 지루한 느낌이 든다. (논문이 아니라고 하고 이렇게 논문같이 쓰면 어쩝니까? 라고 물어보는 사람이 있을수도 있다) 하지만 스마트 아줌마들에 관해 이야기 하면서 ‘~것이다’ 라고 단순히 내 주관적인 생각과 경험으로 말 할 수는 없는 노릇! 따라서 내 의견을 뒷받침 해주는 자료가 필요했고 (물론 이들은 모두 내 논문에서 사용한 자료들이다) 그러한 이유로 이렇게 ‘사실자료’를 첨부하는 것이다. 아줌마들의 스마트폰 사용에 관한 자료는 없지만, 위의 자료를 통해 아줌마들의 인터넷 사용이 급격히 늘었음을 알 수 있다. 그리고 인터넷 사용이 늘었다는 자료를 통해 아줌마들이 ‘스마트폰’을 사용하고 있음을 유추해 볼 수 있는 것이다. 김여사에 대해서 들어보신 적이 있으시라 생각됩니다. 티비 뉴스에서나 인터넷에서 김여사에 대한 에피소드는 많이 듣고 보고 있습니다. 아줌마에 대한 편견에 대해서 포스팅을 했었는데요 (세 번째 성) 한국에는 아직도 아줌마에 대한 부정적인 시각이 만연해 있는것이 사실입니다. 김여사는 그러한 아줌마에 대한 편견을 잘 보여주는 예입니다. 김여사는 주로 운전을 못하는 여성을 지칭하는 말입니다. 대부분의 아줌마 운전자는 미숙한 운전실력을 가진 김여사로 치부되고 있습니다. 대한민국에서 가장 많은 성씨인 김씨와 여사 (중년여성을 지칭)를 합쳐서 김여사라는 단어가 생겨났고, 김여사는 모든 아줌마 운전자를 (운전을 잘하는 사람까지도 포함해서) 부르는 용어가 되었습니다. 티비뉴스를 통해서 보여지는 김여사는 (아줌마 운전자들을 통칭) 미숙한 운전실력으로 매우 위험하고 어이없는 교통사고를 일으키는 데 한 몫(? )을 하고 있으며 자신들이 일으킨 사고에 대해 뻔뻔함으로 나몰라라 신경도 쓰지않는 무식한 아줌마로 그려지고 있습니다. 사실, 말도 안되는 운전실력으로 큰 차를 끌고 나와서 막무가내로 차선껴들기 그리고 역주행하기 더불어 주차공간 모두 차지하기 등등 몇몇 김여사들은 정말 뻔뻔하고 무식한 운전자 입니다. 하지만 아줌마들이 모두 김여사는 아닙니다. 그리고 김여사라는 단어 자체도 매우 성적인 차별이 들어가 있는 단어라고 생각됩니다. 예를 들어, 미스터김 (남자 운전자를 지칭) 이라는 단어는 없습니다. 아무리 난폭운전을 하고 김여사 못지않은 운전실력으로 거리를 누비는 남성 운전자가 있다 하더라고, 그들을 지칭하는 김여사 같은 단어는 없죠. 또한, 김여사는 대부분 아줌마 운전자만을 지칭합니다. 수많은 여성중에 왜 하필 아줌마만 그런 차별을 받아야 하는걸까요? 15년을 운전해오고 있지만 운전할 때 마다 늘 무서워요. 제 생각에는 그들 (아줌마가 아닌 사람들, 남성들)은 그저 아줌마라서 무조건 무시하는것 같아요. 그들은 그냥 우리가 아줌마라서 무시하는거예요. 우리가 운전을 잘하든 못하든 그런 건 관심없는거죠. 아줌마처럼 보이는 운전자는 그냥 김여사 (아줌마 운전자) 라고 보는 사람들. 대부분의 사람들은 그저 아줌마 운전자는 김여사라는 하나의 집단으로 만들어 버리고 그렇게 무시하는 겁니다. 하지만, 이런 말에도 우리의 아줌마들 그리고 김여사들은 당당히 대응합니다. 우리 아줌마들은 강하고 또 아줌마들은 수퍼우먼 이니까요! 우리네 아줌마들은 그들을 김여사로 받아들입니다. 그러나 그저 김여사로 여겨지는것에 머무르는게 아니고 우리의 아줌마들은 더 나은 운전실력을 키우기 위해 노력하고 있습니다. (운전실력이 부족한 아줌마들의 경우에만) 그리고 사실 뉴스에서 보여지는 김여사는 일부일 뿐입니다. 미디어에서 보여지기 때문에 더 확대되고 모든 아줌마 운전자는 운전을 못한다 라는 일반화의 오류를 범하게 되는것이죠. 수많은 아줌마 운전자들은 운전을 잘 합니다. 동시에 수많은 아줌마가 아닌 운전자들 중에는 운전을 못하는 사람들도 있고요. 아줌마라서 운전을 못한다, 아줌마운전자는 다 김여사다 라고 치부하는건 잘못된 것입니다. 이러한 편견은 어쩌면 우리의 ‘아줌마에 대한 삐뚤어진 생각’으로부터 시작되는건 아닌지 다시 한 번 생각해 보고 싶습니다.